Today we're going to write a review of the same game with Grim Dawn, more exactly Diablo 2, which I played two years ago. I assure you that you have played Grim Dawn, Diablo 2 or similar titles will definitely see the following RPG game will be much more challenging: Path of Exile. 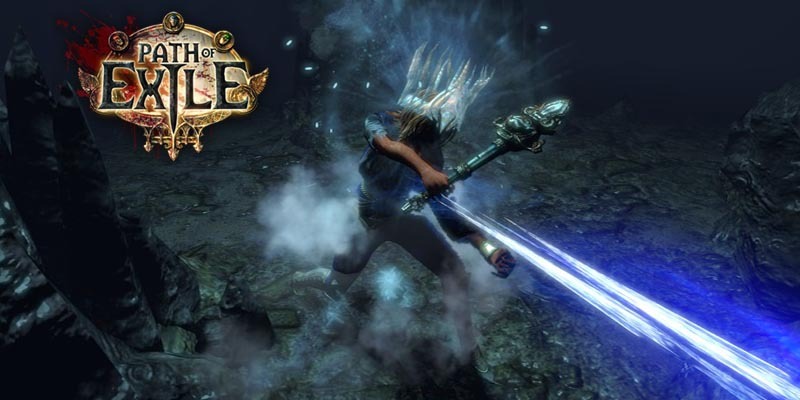 The Path of Exile was first released in 2008 with similar graphics to Diablo 2 but a little better and so far the game has undergone 10 updates. The first time I learned about this game was thanks to his cousin introduced it and I was really impressed by the gameplay as well as its graphics. Currently there are 7 classes: Templar (Not Templar in Assassin's Creed), Shadow, Marauder, Witch, Duelist, Ranger and Scion. These are all but criminals and exiled to the Wraeclast, an island cursed only as a ruin, a mountain of hardship, hijackers, cannibals, zombies, monsters, ghosts, and so many things. other hazards. You will know the reason that characters are banished in the selection of character. You will play one of the seven characters exiled to the Wraeclast. While being trapped in a ship during a storm, the ship suddenly sinks and you are the only survivor and then drifted to the Wraeclast. From where your journey begins. Think this is a new beginning, but later you discover that the island is actually a huge laboratory of King Chitus, the king of the dictatorial empire Oriath, who commanded you Come here, using the blood and flesh of the people here to create something that can help him immortal. After learning this, you decide to destroy him with his army. There is also a scientist who assisted the king for the creation of immortal medicine. You will destroy him as soon as you see the Emperor Chitus to play the king, ending act 4 (I just played here, then I gave up the game and then only to act 4). Now the game has come to act 10 with new storyline and I want to play it again. This can be considered as the most confusing of the game. The same skill tree, but each character has different origins, such as the Ranger, its starting point to the right of the lower corner, the starting point Scion in the middle or the starting point Templar. Located on the left corner of the skill tree. The most unique skill tree in the Path of Exile is that all skills are Passive Skills. Each character also has Ascendency Skill. This is a special skill that represents each class and you have only up to 8 points while each class has three types of Ascendency skills (except Scion has only 1), you can only choose 1 and each ascendency skill has less The best is about 12-13 boxes when you only have 8 points. In order to get ascendency skill, you have to overcome the labyrinth of traps and monsters, not to mention you have lost the way and if you open the wrong door you will be locked up and forced to lower the monster in there the new door open and you can move on. Death, travel from the beginning. Careful! Once you have raised the points, it is very difficult to bleach and if you bleach you can only bleach a few points can not bleach it all as in Grim Dawn. So if the wrong point to make the character is weak, only the way to play the new character. Red: Specialized for melee weapons such as knives, hammers, etc. Green: Gem specializes in long range weapons such as bow. Blue: Gem is for those who play spells. The gems also have gems that support gems called Support Gems. Gems can be attached to items such as weapons, hats, armor, shoes, etc. The place to place gems is called Socket. For gloves, hats and shoes, the maximum number of sockets is 4, the vest is 6, the arm is 6, the arm is 1, the ring is 1. The sockets are linked together ( called links) so that the gems can support each other better and not all the sockets in an item can be linked. For example, your shirt has six sockets, with only four sockets linked together. If gems are attached, only up to 4 gems can be combined. Sockets are also available in red, green, and blue. Red gems can only be attached to the red socket, similar to the other two. There are also remedies that you can only bring up to 5 cannons. Each pot contains a certain amount of HP, mana, or certain uses. For example, a potion that contains 5k of blood can only be used in that range, meaning that you are only allowed to hit 5k damage and not hit or hit the sky. However, the potion can recover only when you destroy monsters. Another new thing in this game is the currency system. The monetary system in PoE is not as simple as other RPGs. PoE does not use gold, coin, or irons as in Grim Dawn, which uses crafting currencies as poe currency for trade. Crafing currencies can be used for items to improve, change the nature of an item, or use it to exchange items with other NPCs, even with other players. For example, if you have crafting currencies A, B, C, D, the items you want to trade are 2 A, or 1 B or 1 A, and 1 C. However, falling only about 0.001% then you should keep do not spend on your very own item. Another new addition is the Hideout and Master system. Hideout is your shelter for you to create for yourself. You can decorate, craft items here. Here, you will invite the Master on his hideout. Master is the NPC that you will encounter during the game. There are a total of 8 master masters and each master specializes in one field, such as Haku, Armor Master, Armor Master, Armor Master, Vagin, Master Assassin, Vagan, Master Assassin, When you first create a Hideout you can only invite 2 people. Then you need to raise the reputation of the master to a higher level to get a more spacious hideout, adding more master. You can invite up to 7 master on your hideout. After the download is complete, in the game then, you can disable fake and play to help lag because this game does not have offline mechanism. The game can only be played online so it is quite annoying, dropping the net is a joke. You can only see other players only when in the area called "home", the area where the NPC sells items. And when the monster is hit, each player will be put into a completely different dungeon unless you party together to go together. The game really takes a lot of time to plow, the monster is very strong and at the same time very slow level especially when you are in level 80 with complex skill system so generally difficult game. But in exchange for this game is Free-to-play so you can enjoy the game freely, do not like to delete. Money can only buy skin, costume for beautiful. But in general I am sure you are passionate about the RPG genre will enjoy.